This unique project is not your average duct tape construction. I decided to use something other than duct tape to create the seams, giving it a much more finished, unique look. I really wanted to find a way to sew my duct tape patterns together. I found that machine sewing does not work very well, because the needle tends to get gummy. However, sewing with a thicker material through duct tape that has been punched works great. I love the look of leather, and have enjoyed making a few custom pieces out of it. However, leather is expensive and also not ideal if you know your project is likely to be exposed to moisture. Duct tape is inexpensive, durable, waterproof & lightweight, perfect for creating custom items for holding all sorts of things. I created the pattern for this knife sheath I wanted to share with you, but wanted to let you know the possibilites are limitless when you use this sewing method. You can get creative and sew all kinds of duct tape projects this way. Anything that you see sewn out of leather or other thick material can probably be made from duct tape fabric. Be sure to check out my other examples of this- the belt knife sheath and Christmas stocking, or design a pattern of your own and use this method to sew. Be sure to send pictures if you create something cool. We want to see and share your projects. 2. Make your 8.5×11 duct tape sheet in the color of your choice. If you wish, you can add a third layer of tape to increase durability. If you do not know how to make a duct tape sheet, you can find our tutorial for this by clicking here. 3. Cut out the pieces of the pattern, leaving a little bit of white border around them, then tape them to your duct tape sheet. Place the large piece first so that it fits on the page, making sure all pieces fit before you tape them down. 4. Using your scissors, cut out the pieces of the pattern taped to the duct tape. You should now have the three pieces for your sheath. 5. Using your hole punch, punch through each dot on the pattern, trying to keep them evenly spaced like they are on you pattern. Continue punching until you have punched all the holes in both pieces. Line the center of the hole punch up with the dots on the pattern. 6. Using your Xacto knife, cut through the two lines on the pattern, the ones between the two circles. 7. Now you will need your rivet and snap as well as the third small piece you cut from the pattern. This is the strap that helps hold the knife in place. Place the rivet through the two holes and use the hammer to set it and attach the small piece to the holster. 9. Place the snap on one side of the strap, keeping the shiny front on the front side, and the back of the snap on the backside. Check to make sure they close properly before you hammer. Hammer each one in place to set. Place the snaps on the piece of duct tap that is the strap, hammering both in to set them. 10. Line the two large pieces up so that the holes are close together (they will not line up completely, as the outside is a bit larger to allow room for your knife.) The largest piece is the back and the smaller piece is the front. 11. Cut your lacing to size, if necessary. Tie a knot close to one end. Run it through the two holes from back to front. The knot will remain on the back. 12. Now begin lacing, going from top to bottom, then back around the side to top. This will leave a uniform edge of stitching along the outside of your sheath. 13. 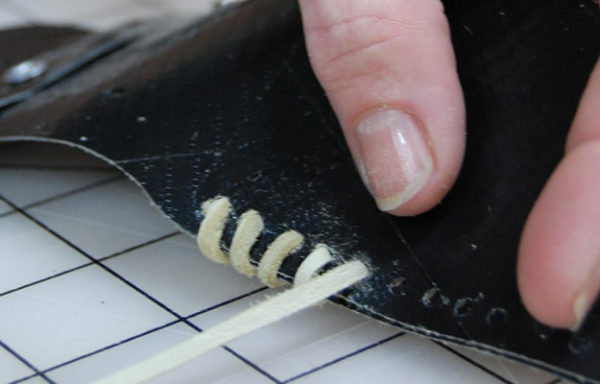 Continue lacing until you have gone all the way around the sheath. 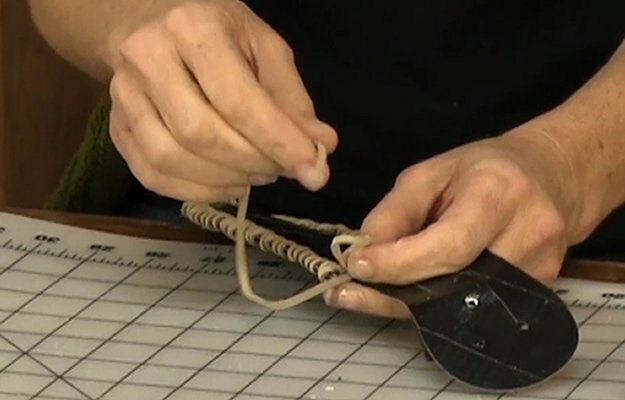 Tie a knot on the backside, keeping it as close to the sheath as possible. Trim any extra lacing off the end. 14. Your sheath is finished and ready to wear. Ingenious….,.,I knew guys on the east coast who would use duct tape instead of fiberglass to repair rusted out spots on their cars. Some even went so far as to paint….no, just kidding. About the paint that is.